Serums are super important to any skincare routine when you are trying to address particular concerns. They tend to have a higher concentration of treatment ingredients and a lighter texture (smaller molecules) than moisturizer so that they can penetrate deeper into the skin to deliver those ingredients. Just like serums, Dermalogica's boosters have a lightweight texture and are powerful skin treatment products. They can be used on their own or mixed in with moisturizer (I tend to use them on their own). I picked these serums/boosters because I'm all about trying to fix fine lines, crepey dehydrated skin, dark spots and uneven skin tone. These three products have been my favorites for well over 2 years now. 1) Dermalogica Hydrating Skin Booster / how I use: in the morning after a toner, before moisturizer, on my forehead, cheeks and neck/decollete area // I love paring this with my Avene Thermal Spring Water spray because the Hyaluronic Acid in it helps bind that moisture to my skin. My fine lines are plumped up and look less noticeable. Also, my neck area looks less crepey. NOTE: This is great for the face and throat, but not meant for eyes, so I use something else for the eye area - stay tuned to learn what that is! 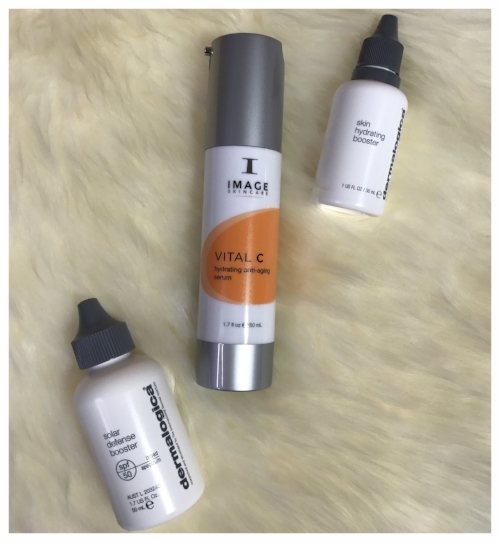 2) Image Skincare Vital C Serum / how I use: at night after toner, before moisturizer, all over my face, neck and decollete (not on eye area) // I added a Vitamin C serum to my routine because my skin was feeling dull and lifeless. I needed something that would help combat the pollution and stress that I was dealing with living in the San Francisco Bay Area (big city stress - eek!). And while I've tried many Vitamin C serums over the years, I never found one that I liked because they were all too active for my skin, they would burn after application. I was afraid they were doing more damage then good. Then one day, I met the founder of Image Skincare - Janna Ronert - and she told me about her sensitive skin and how she created the Vital C Serum for sensitive skin types. She gave me a sample and I've been hooked ever since! This serum is amazing! I noticed a difference right away. My skin has a glow after using it and now I can't imagine life without it. Because of the success with this product, I have tried other products from the line and have never been disappointed. 3) Dermalogica Solar Defense Booster SPF 50 / how I use: daytime after moisturizer or sometimes mixed in with my moisturizer, all over face, neck and decollete (not the eye area) // This sunscreen is my favorite because it feels lightweight on my skin, has antioxidants (so it helps fight free-radicals) and doesn't make my skin look chalky, especially in pictures. I also love that I can mix it into my moisturizer if I'm in a hurry. NOTE: This one is made for combination/drier skin types, and leaves my skin looking a little dewy. They do make a matte SPF (my hubby loves that one), so there is something for everyone when it comes to Dermalogica. they usually are the second or third step to any routine: 1) cleanser 2) toner 3) serum 4) moisturizer 5) SPF 6) don't forget about eye cream! try not to use multiple serums at once, unless instructed to do so by the brand. This helps to ensure that ingredients don't react badly with each other or cancel one another out. To help with this, alternate the times you use them. For instance, I do one serum at night and another during the day. serums are pretty concentrated with treatment ingredients, thus the price of them is usually higher. They tend to do most of the work out of all the skincare products (cleansers, toners, moisturizers, etc.). So if someone is having a hard time deciding which products to buy, or can only buy one ... serums are the ones I suggest people invest in first. They give the most bang for your buck. sure you can wear a serum by itself, but it helps to seal it in with a moisturizer, to create a barrier - to keep the good stuff in. not sure if you should buy? Request a sample first. It always helps to try before you buy. Plus if you have sensitive skin, its a great way to test out the ingredients first.